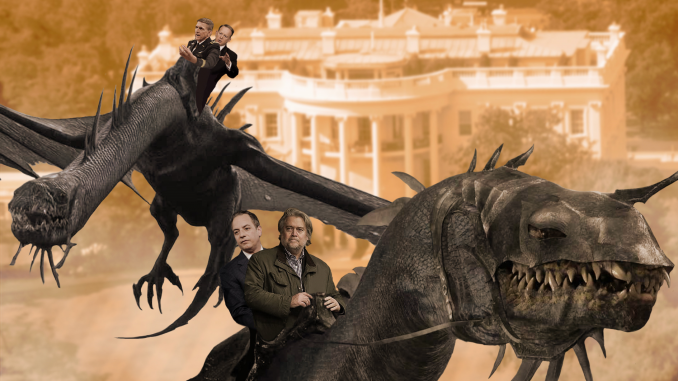 WASHINGTON, DC—Nine fired Trump advisors returned to Washington DC this afternoon in a show of force, riding on the backs of winged fellbeasts, locals reported. Current Trump officials fled, believing this move signaled President Donald Trump had refilled their positions yet again, and fearing disembowelment by the sharp claws of the dragon-like creatures. Given the recent firing of Rex Tillerson via a tweet, this was yet another unusual personnel move by the President, political analysts said. The fellbeasts landed on the White House lawn and were seen chasing Sarah Huckabee Sanders through the Roosevelt Room. The stench of the winged fellbeasts was reported to be so strong it caused city-wide vomiting, although some believed it could have just been the normal odor associated with former White House Chief Strategist Steve Bannon.